This article originally appeared in The New York Observer in 1993 and is anthologized in Luc's wonderful collection of essays, Kill All Your Darlings. If Christmas is designed to bring out the child in everyone, then New Year's brings out the fool. Sobriety is temporarily fashionable nowadays, so fewer people than usual will wake up this January 1 partly clad, in a strange hotel room, with a blinding pain above their eyes and an elusive song on their lips, but that does not mean that more people will wake up without regrets. All over the world, suckers from all walks of life will send 1993 into Chapter 11 while under the impression that they are forever free of its debts, and they will demonstrate their insouciance by, at the very least, spending way too much money on dubious entertainment. Elsewhere, people will be hit by stray bullets and will hit each other with intentional bullets, all vying for a place in the January 2 tabloid wrap-ups as the last homicide of the old year or the first of the new. The first baby will arrive at an area hospital and probably use up its lifetime allotment of fame then and there. Taxi drivers will gouge passengers and suburbanites will smear each other all over the roads. There may or may not be a subway fare increase, a transit strike, a sanitation strike, a gravediggers' strike. Celebrities will resolve to practice tolerance and promote world peace, and representatives of the media will treat these utterances as news. The following day, the aged members of the Polar Bear Club will take to the icy waters of Coney Island. All this diverse behavior might as well be encoded in our DNA, so programmatically does it fall into atavistic patterns. The New Year's celebration is as old as time, and its constituent features are remarkably consistent from continent to continent and century to century. The only really major difference is that few cultures have historically celebrated their turn of the year at quite this time, many opting for the more logical vernal equinox, or at least the winter solstice itself; it is to the Romans that we owe the curious present position a week and a half after the solstice. But anthropologists beginning with James Frazer, in The Golden Bough (1890), have sorted the New Year's rituals of most cultures into four distinct parts that have, cosmetic changes aside, held into our own day. These segments are, in order, Mortification, Purgation, Invigoration, and Jubilation. The first of these may appear the most remote. It is the period when, in preindustrial societies, all business was suspended. In some cases those days fell entirely outside the calendar, and were not spoken of the rest of the year. Nor, during those days, were marriages or litigation conducted, and fasting was practiced—the obvious survivals are Lent and Ramadan. Among certain societies the Feast of Misrule was celebrated then, at the tail end of the old year. The Babylonians stripped their king, made him kneel, and had the high priest humiliate him in the public square. Other societies deposed their ruler, sometimes killed him, and sometimes elevated servants or other members of inferior castes to temporary positions of power. Decorum was turned on its head, laws were contradicted, chaos reigned. Does any of this sound familiar? At least the fact that this interval lasted twelve days has left its mark on the modern holiday, both in song and in the vacation corridor between holidays claimed by anyone who can get away with it. The most recent recorded celebration of the Feast of Misrule, though, occurred in 1975, in Pontiac, Michigan, when Elvis Presley split his pants on stage just before singing "Auld Lang Syne." If it appears that our civilization has become too restrained or repressed to practice this sort of dispatch in any form other than spring cleaning or January white sales, then consider the three-hour riot in Reno, Nevada, in 1979, when thousands of revelers ran rampant, looting shops and injuring seven policemen. Significantly, many of the rioters carried placards denouncing the seizure of American hostages by Iran, whose minions they were presumably punishing through the proxy of Reno appliance stores. Then again, this had nothing on the Fort Lauderdale riot of 1972, when four thousand caused damages resulting in forty-four arrests and twenty-seven wounded cops, but the records are imprecise as to motive An exorcism of the Christmas spirit itself may have inspired the Quebec City firebug who in 1979 set a Yule tree alight, ultimately resulting in forty-two deaths, but it was apparently an obscure animus against the Norwegian legal system that prompted a Londoner to attack the Trafalgar Square tree—a gift from the Norwegian government—with a chainsaw on New Year's Eve, 1990. A year earlier, drunken guests of the Atlanta Marriott Marquis may have been protesting generic contemporary architecture when they threw potted plants and fire extinguishers from upper balconies of the forty-seven-story, atrium-centered structure, resulting in fifteen injuries and fifty arrests. Invigoration, the following item on the traditional New Year's program, has two major features: the mock combat and the period of sexual license. Both are expressions of sympathetic magic, intended to promote fertility and crop growth. In the former, such oppositions as Life versus Death, Rain versus Drought, Summer versus Winter were enacted by teams of citizens, or pairs of people on hobbyhorses. The struggle between Alexander the Great and his rival Darius was still being played out early in this century, notably in Scotland. On the border between England and Scotland, the combat was not always all that mock, but it was eventually sublimated into the form of a football game—the spread of this folkloric detail is obvious. In England, villages might stage dancing matches with each other, while the populace yelled, "Hey for our town!" Elsewhere, fruit trees were beaten with sticks—by the French, the Germans, the Jews, the Belgians, the New Caledonians—to persuade them to bear heavily in due season. And then there's noise, which has always been a big part of ceremonies around the globe. The Tyroleans rang bells and cracked whips, the Japanese agitated bamboo rattles, the Chinese set off firecrackers, the Jews blew the shofar, the Siamese fired guns. This traditional element has remained vigorous into our own time. Consult newspapers for almost any year you choose, in this century or the last, and you will find accounts of hapless bystanders slain by bullets sent up into the air by folks who did not consider that they might eventually have to come down. The two or three annual victims of this practice, invariably asleep in their own beds when death came through the window, make for a routine item on page 37B of your average tabloid's January 2 issue, but it is the Filipinos who truly excel at this sort of carnage. Every year, greater Manila sees the maiming of hundreds from stray bullets as well as from fireworks. Then there was the case of the two partygoers in Glenwood Landing, Long Island, who at the close of 1985 fired into the air on the grounds of the Swan Club and brought down a pair of Canada geese. They were charged with hunting without a license. Further refinements include those of the man in Bossier City, Louisiana, who saw out 1986 by firing fifty-five rounds with an automatic rifle into a packed cocktail lounge; the enthusiast in Cleveland who bade farewell to 1984 by shooting up a stop sign, his bullets continuing on to penetrate the wooden wall of a church and slay an eighty-four-year-old minister at his pulpit; the person in 1977 whose response to being asked for a two-dollar cover charge at a Bronx social club was to shoot the place up. And so on. The longstanding popularity of this sort of holiday merrymaking provoked the Daily News to run a message from a retired head of Scotland Yard urging the United States to enact a total ban on firearms, citing them as the major cause of violent crime. That item ran on January 1, 1923. In an earlier age, murderers might have been given pause by the idea that the dead were said to return to earth on New Year's Day, at least among the Finns, the Hopi, the Zuñi, the Lithuanians, and the Mandaeans of Iraq. Everywhere, the turn of the year and the year's first day hold ominous significance for the 364 days to follow. Such Romans as engaged in agriculture went through an elaborate charade of pretending to farm on the holiday, so that they might set in motion a year's worth of such activity, and in Brandenburg, Germany, much closer to our time, people similarly went through the motions of all sorts of work, to the extent of keeping corn in their pockets so that they might grind it with their fingers while sitting in church. The Japanese forgave all debts; most people in all countries made it a point to return anything borrowed. In many countries the future can be read on January 1 by examining the ashes in the fireplace, or through the practice of bibliomancy, which consists of interpreting the first line of a randomly chosen page of the Bible or of Virgil. An early American work, The Shepherd's Kalendar of 1709, indicates that if the year's first day opens with dusky red clouds, it denotes "strifes and debates among great ones, and many robberies to happen that year." The first person one encounters on New Year's Day is considered extremely significant—in Silesia, for some reason, it was considered unlucky to meet a beggar or a gravedigger. The first foot to cross your threshold was important, too, as to whether it was a right or a left one, and to whom it belonged. The sexual license allowed by this period of the New Year's program is an item about which traditional sources do not seem to have a great deal to say, other than that, for example, the Druids exchanged mistletoe with one another, but, on the other hand, much importance is accorded the infant. He's the one with the top hat and the sash, immediately to the right of the white-bearded character with the scythe. In Winsor McCay's 1914 cartoon for the old New York American, he was the one in the flivver who ran the old man's jalopy into the ditch. For many years, all newspapers other than possibly the Times represented him literally, in a front-page photo. In a few years the practice will probably be revived. The fourth component of the annual ritual is jubilation, otherwise known as feasting and wassail. In Northumberland, the practice of dropping in on neighbors to eat cake and drink wine was called "fadging," which sounds appropriate. There were recommended foods—honey for the Romans, bread baked in rings for the Swabians, fish for the inhabitants of Mecklenburg—and proscribed foods: rice in China, dumplings in Germany, nuts among the Jews. 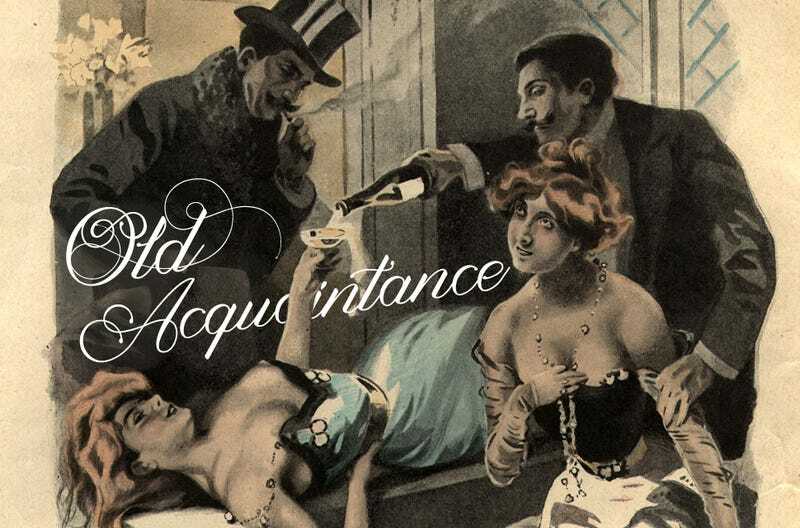 The consumption of alcoholic beverages was, of course, significantly widespread and New York City for most of its history was no exception to this rule. A coroner's verdict from 1786, for instance, accounted for a New Year's fatality as "occasioned by the freezing of a large quantity of water in his body, that had been mixed with the rum he drank." Washington Irving, writing of the Dutch governors in Salmagundi, noted that one of them saw out the old year by "plying his guests with bumpers, until not one of them was capable of seeing." By 1914 or so, the rich who hosted parties of five or six at hotels like the Vanderbilt or the Ritz were capable of spending five hundred to eight hundred dollars for the evening, a staggering sum for the time—the same newspaper item noted that at Second Avenue locales such as "Greeny Mike" Bassetti's or the International Café, the same party could imbibe an identical quantity for a ten-spot. Then Prohibition came down, in July 1919, and although the Volstead Act that gave it its teeth was not to take effect until the following March, the New Year's Eve that fell between those dates was a grim one for most of New York. The American complacently set the scene: "The rough slam-bang crowd with ticklers of past years was missing. In its place there were thousands of well-dressed men and women all bent on seeing the old year out." Translated, this means that the prosperous could repair to the big hotels, which were cleaning out their stocks of liquor, while the masses were simply out of luck, since their saloons had depleted theirs and, unable to reorder, had mostly shut down. But cheer was not long in returning to the metropolis, in excessive quantities, in fact, since people who drank modestly before Prohibition tended to become two-fisted boozers during it. New Year's Eve 1922, for example, was a rip-roaring affair during which agents raided the Swiss Chalet, the Knickerbocker Grill, the Plantation, the Palais Royal ("where Yanda Hoff was starring in classical and other dances"), the Palais de Danse, the Hotel Pennsylvania Grill, the Turf Club, the Club Royale, the Jolly Friars, the Little Club, the Ambassador, the Strand Roof, Shanley's, and Gipsyland. The following year, people were paying average cover charges of from $7 to $15 to get into most of these same places, and anywhere from $2.50 for a bottle of dubious gin to $25 for decent champagne, this at a time when the latter sum represented the monthly rent on a respectable apartment. "1924 was born with a corkscrew in his mouth and a pint flask on his hip," somebody said. Two years after that, 1926, Gus Knudson and Karl Ottoson fell out of a second-story window on Fulton Street in Brooklyn while arguing over whether it was 1924 or 1925. That same night, Mrs. Catherine Kelly, also of Brooklyn, broke her leg above the ankle dancing that version of the Charleston called the Buffalo. The following day, a candy store at Broadway and Forty-ninth Street was giving out free Bromo-Seltzer with every purchase. And so it went, until very recently. In 1965 an adult elephant, dyed pink, was brought into the ballroom of the Sheraton East. Hangover jokes were plentiful in newspapers until the late 1970s. The slack was taken up thereafter by violence stories, misery stories (that of the penniless Florida couple and their nine kids, who spent a freezing New Year's night in 1977 in their disabled station wagon on Route 3 in Rutherford, New Jersey, was a harbinger), wretched-excess stories (the two-thousand-dollar ticket to attend a concert by Julio Iglesias and Regis Philbin at the Essex House in 1985 was a longstanding record-holder). Eventually, everyone will stay home doing calisthenics and practicing mortification, until something, like knowledge of their imminent and unavoidable doom, drives them out into the streets to carouse again and send themselves to the devil. Luc Sante is the author of Low Life, Evidence, and The Factory of Facts. You can find the above essay in his anthology, Kill All Your Darlings.